Yet another game now available, which in truth I hadn't read that much about until today. First thoughts were an underwater No Man's Sky and will continue to be that until I have a look at it for myself. 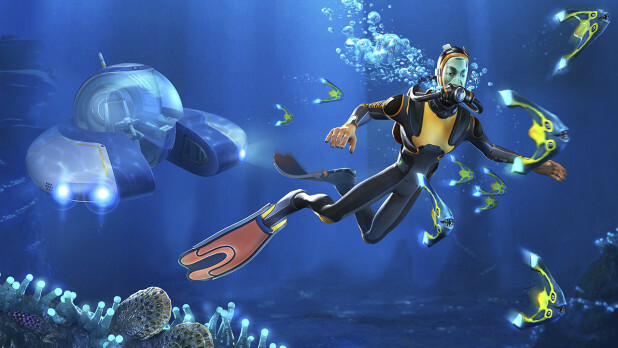 The release of Subnautica on Xbox One will see it follow the same development path as the Steam Early Access release of the game on the PC. The Xbox One version will also launch with content up to and including the H.2O Update, (an update I have no clue about) a recent update to the Steam counterpart featuring a stunning underwater graphics upgrades (Shall believe it when I see it oh press release tease). Subnautica is classed as a underwater, open-world, adventure game, so you see why I'm saying No Man's Sky. You can try the game out for free, or buy it in this early state for just £15.99 As with every game in the preview program you're basically buying the game in an alpha state, and get the chance to help the game become the best it can be before getting its proper release, normally at a higher price too. Got this downloading now so will be back with some gameplay for you later.You can add the game to your Xbox One download queue by clicking here.